Add spelt, three times as much water and salt to a pot over medium heat and let simmer for approx. 30 min., or until the spelt is done. In a second pot, add beluga lentils, the double amount of water, and salt and bring to a boil. Reduce heat to medium-low, then place lid on the pot and let simmer for approx. 25 min., or until the lentils are done. Preheat oven to 200°C/390°F. Finely chop parsley and chives and set aside. Cut carrots into sticks. Peel rutabaga, celery root, parsnips and sweet potato and cut into bite-sized pieces. Chop sunchokes and halve Brussels sprouts. Add vegetables to a large bowl, drizzle with some of the olive oil and season generously with salt and pepper. Transfer to a baking sheet and roast in the oven for approx. 20 min. In the meantime, toast sliced almonds in a frying pan until fragrant, then remove from heat. Add remaining olive oil, apple cider vinegar, mustard, honey, ground coriander, sumac, and cayenne pepper to a small bowl and whisk to combine. Season with salt and pepper to taste. 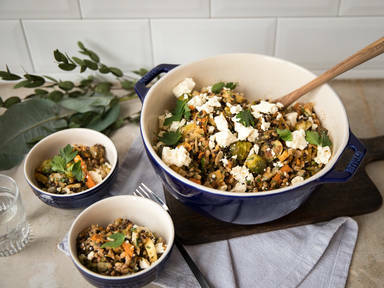 Add roasted vegetables, cooked spelt, beluga lentils, vinaigrette, parsley, chives, and roasted almonds to a large bowl and stir to combine. Crumble feta cheese on top using your hands. Enjoy!